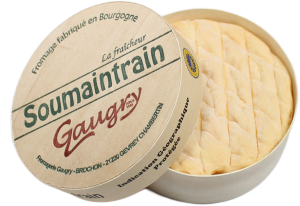 Soumaintrain is a cheese from the Yonne, where it has been handcrafted by local farmers for more than a century. It is a soft cows’ milk cheese with a washed rind. Enjoy with a green salad on hot croutons, served with a white wine: Bourgogne Aligoté, Chablis or a white wine from the Loire region. If you’re savouring it unheated, a twist of the pepper mill will help to bring out its best aromas.